Depending on the availability of of entertainment budget, such that it is these days, I may purchase a bellydance costume that would match the rest of my intermediate class and the advanced class. I'm cautiously excited about it, because I'd really like one, but I don't know if we can swing it this year. We'll see. But at any rate, Claire mentioned it to us, if we'd like to do it so as to perform with the group at spring and summer events. 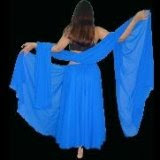 The costumes consist of a flowy skirt, what is called a "choli" top - a half top, usually with short sleeves - and a veil. Hip scarves are also used, but not included in the costume. They come in a multitude of colors, and since I already own a hunter green chiffon hip scarf, and one of the costume colors is dark green, I'd likely go with that to conserve a bit. I'm very much a "green girl", so this works. I'm hoping it will work out, because they're terribly pretty and exotic looking. I imagine a definitely princess-feeling would ensue, which I'm absolutely all about.